Forty and Fabulous was the theme for this cute little set up. Our metallic balloons had a mind of their own, it was nearly impossible for us to get the 4 standing properly long enough to get the perfect picture. The desserts however, were flawless. I was obsessed with the macaroon towers from day one of designing them, as they were my main focus since we first started designing this table a month before the main day August 05, 2017. The beautiful macaroon towers were made by creating delicious hombre colored macaroons from strawberry to vanilla. Colors arranged by dark pink to light pink all the way to white at the top of the tower. The macaroons and rest of the desserts were created by HersBakery. These raspberry cheesecake tarts were probably my second favorite treat, also made by hersbakery. The tins were a reflective white picking up wonderful color from the sequence table cloth. Everything on this table was very bohemian chic with a touch of glam. Perfect for a fabulous forty birthday party. Loved the cake pops that tasted as delicious as they looked. Perfect soft pinks and whites with rose gold sparkles. A dessert table adds to the ambiance of any event. Guest are always excited to look at the dessert table and truly enjoy the treats once the bar is open. It’s always a great idea to open the dessert bar after dinner around the same time you cut the cake. This allow the guest to choose the type of dessert they want or if they prefer cake. A two tiered bohemian style cake decorated with fresh flowers. Surrounded by gold candles. Surrounding the cake we had delicious vanilla and chocolate cupcakes with white frosting and rose gold sprinkles. In between the cupcakes are a couple dozen of Lemon Meringue Pie, mini cups. This set up accommodated 100 guest and many had seconds including myself. Dessert tables can be done for any occasion, any theme and a reasonable budget. It definitely adds a lot of fun energy to any occasion. Most popular for weddings and sweet 16’s. 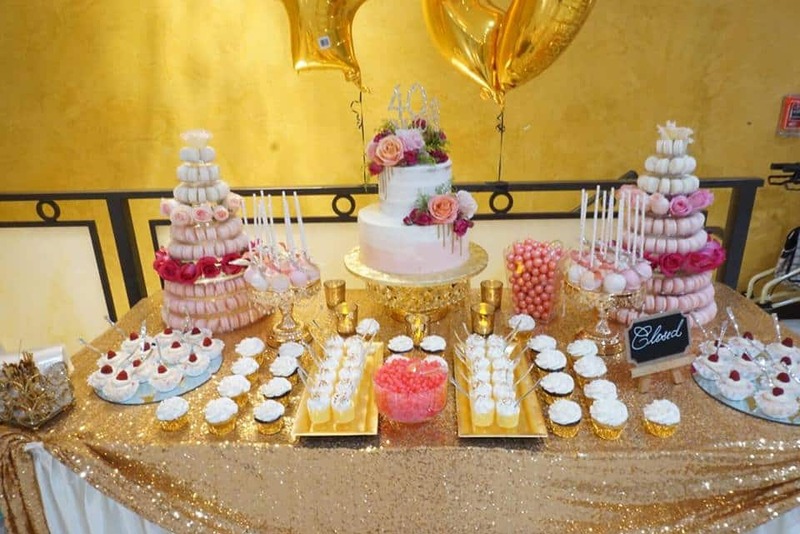 If you are interested in having a dessert table at your next special occasion and would like our team to help you design and set up your dessert table? Please do not hesitate in taking a moment to fill out our contact form and someone will respond within 48 hours. What best describes where you are in the planning process? What services are you interested in?